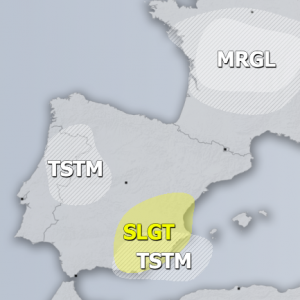 It appears an outbreak of severe storms can likely be expected across east-central Spain tomorrow, Thursday July 6th. While the upper ridge extends from SW towards central Europe, a rather deep upper low enters the Iberian peninsula from the west. Rounded by a very strong jet stream (60-70 kt at 500 mbar) and overlaps with moderate to strong instability across the warm sector ahead of the cold front slowly moving east. Storms are expected to form by midday as a strong ascent for scattered storm initiation overspreads the risk area. Given the good overlap of strong shear and instability, numerous severe storms are expected, including intense supercells with large hail, severe damaging winds and torrential / excessive rainfall due to slow moving storms. Low-level SE inflow layer should enhance tornado threat with more discrete and stronger cells. 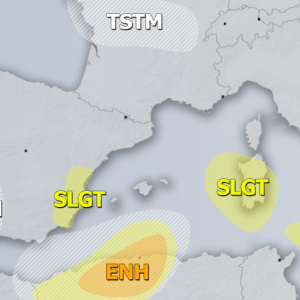 Boundary layer moisture will undergo a significant recovery due to the E-SE low-level winds advecting warm and humid airmass from the western Mediterranean. MLCAPE around 1000-1500 J/kg can be expected, below is the MUCAPE map, however. 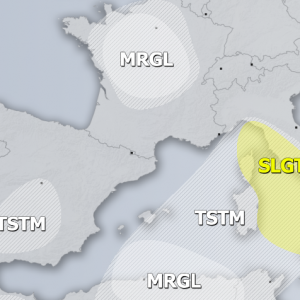 Storms are expected to merge into large cluster or two (MCS) towards the evening hours and continue into the night with mainly severe damaging winds and torrential rainfall /flash floods threat.